Recognized as one of the foremost LASIK surgeons in San Diego, Dr. Motwani is also considered an authority in the field with his advanced laser techniques, including those he personally developed. Dr. Motwani has been performing refractive surgery in San Diego since 1999. He is a graduate of the prestigious Rensselear Polytechnic Institute in Troy,N.Y. with a B.S. in Biology. He attended one of the oldest medical schools in the country, Albany Medical College of Union University in Albany, N.Y. His Medical Internship was performed at Albany Medical Center in Albany, N.Y. His Ophthalmology Residency was performed at New York Medical College in New York City, which serviced five hospitals in Manhattan, the Bronx, and Westchester. Although Dr. Motwani initially certified and started performing LASIK on broad-beam lasers, he was one of the early adopters of the Nidek EC-5000 scanning slit laser technology. He has continued to be on the forefront of techniques with this advanced laser system, and has had excellent results in the use of wide reshaping zones to minimize halos and night glare, treatment of high astigmatism, and repair of eyes with prior refractive procedures. Dr. Motwani was the first in the United States to utilize the unique, patented aspects of the Nidek EC-5000 to perform aspheric corneal ablations in 2002. His early work began to show that wavefront guided ablations were not the best answer to get better visual results, but that prolate wavefront optimized ablation patterns were the future. Much of the rest of the profession has come to accept aspheric ablations as the future. 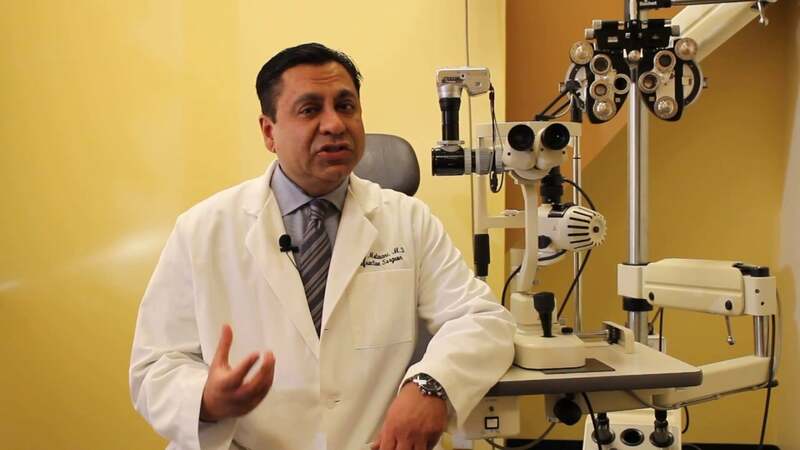 Dr. Motwani observed the development of the Alcon Allegretto Eye-Q Wave Excimer Laser System for several years. As it became obvious that this system was taking his aspheric ablation work to the next level, he acquired the latest 400 Hertz version of this system which he considers to be the most advanced, fastest, most accurate laser available. Dr. Motwani was also an early adopter of Moria microkeratome systems, the flap making devices used by many leading refractive surgeons. Dr. Motwani used the original Moria LSK One, which although one of the most technically challenging microkeratomes for the surgeon, was widely considered one of the most reliable for the patient. He was also one of the early adopters of the Carrazio-Barraquer microkeratome, which further increased the flexibility and reliability of the procedure. He has since become one of the early users of the Moria M2 microkeratome, which has further increased the safety and reliability of corneal flap creation, and enhanced the flexibility available to the surgeon to operate on difficult and challenging eyes. He was the first surgeon in San Diego to perform the Epi-LASIK procedure, the epithelial only flap procedure for complex cases where a normal LASIK flap cannot me made or used. He was also one of the first surgeons in the world to use successfully use and incorporate this procedure to treat high myopia and myopic astigmatism patients that were not candidates for any of the other LASIK procedures. Dr. Motwani is the first surgeon in San Diego to incorporate the Z-LASIK procedure using the Ziemer Femtosecond Laser Da Vinci system into his practice. Dr. Motwani held off on adopting an All Laser LASIK procedure until development of the femtosecond lasers made for a better LASIK procedure. The Ziemer is the most advanced laser microkeratome system available. Dr. Motwani performs a variety of refractive procedures. His personal philosophy is that he will not perform a procedure because it is the latest hype or gimmick, but will only perform those procedures that are proven to work effectively and safely, and he will always work to advance the state of the art. His work has focused on not only ensuring that patients get the best, most accurate laser vision results possible, but also on inventing procedures and techniques to allow even the most complex procedures an opportunity to have laser vision correction. Many of these patients are not able to see properly even in contacts and glasses, and these laser procedures can make them see better than they have their entire life. Dr. Motwani finds special satisfaction in these life-altering procedures. This has attracted many San Diego notables to have their LASIK performed by Dr. Motwani, including over 90 San Diego physicians, many other healthcare providers such as nurses and technicians, San Diego Padres ballplayers and executives, professional and amateur athletes and coaches, prominent attorneys, firefighters, sheriffs, and police officers, military officers, and CEOs of corporations. To ensure the safe and reliable visual outcome of these and other patients, Dr. Motwani maintains that careful pre-operative measurements must be performed with the involvement of the surgeon, and the critical post-operative care after the refractive procedure must be monitored and performed by the surgeon, a medical practice that only select few refractive surgeons are pursuing today.